Tina + Angelo's destination wedding in South Carolina was a true celebration of their mutual love and affection for this southern gem of a city (second only to Savannah, in our extremely biased opinion). 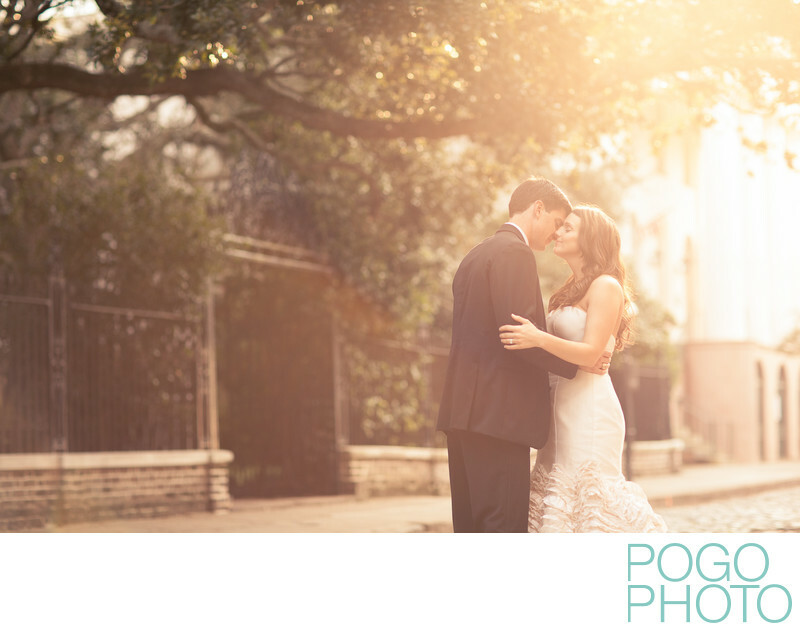 Their wedding day itinerary was extremely packed, so early on this couple decided to also book us for a day after session, giving us precious time in the golden late afternoon glow to wander the quiet Sunday streets of Charleston, rediscovering the old streets, wobbling on the cobblestones, and creating portraits like this one that shine with beauty and love. This image has a lot going for it: compositionally it draws your eye right to the couple's faces, not only with the rule of thirds (the focal point is placed in the top right area), but also with the leading lines that the graceful bow of the old oak trees and the wrought iron gate that runs along the street behind them. A real sense of this southern city can be felt from the brickwork, the cobblestones on the street, the sweeping tree branches, and the dangling Spanish moss, not to mention the hazy golden sunlight that seems to catch the very air on fire. Tina chose to wear her hair differently for this session than from her wedding day, which let her avoid making the difficult decision: she could have both an updo and a more casual, sultry look with loose waves. The relaxed feeling that emanates from these two is genuine; after an exuberant night at their wedding reception and a late brunch, the slow start to their day felt natural and peaceful, and oh-so-southern. 1/1000; f/2.0; ISO 400; 85.0 mm.